CRIME ALLEY, The Capital District’s best sketch comedy group, returns to the Mopco Improv Theatre for a Comedy Double Header! A fully improvised musical experience inspired by the audience. Will they succeed or join the ranks of the eliminated? Come laugh and cheer to see who will be this month's Maestro! RIVERS CASINO: Theatresports Dinner Show! Tickets are just $30. Doors open at 6:30PM, Dinner & Entertainment begin at 7PM. Guests can purchase tickets through Proctors. What The Hell Is Going On?!? With Ryan Shanahan is a live talk show like no other, with an unforgettable cast of characters, special guests, and games to play with you, the audience, live on stage! Cheer on your favorite team of comedians as they compete in this do-or-die mix of side-splitting comedy and serious sporting action! Come see an evening of all female, all improvised comedy. Ladies get a discount at the cafe tonight with $1 off our beer and wine. Bring a group of 10 or more to save money on tickets! OR buy out the whole theatre and save even more. 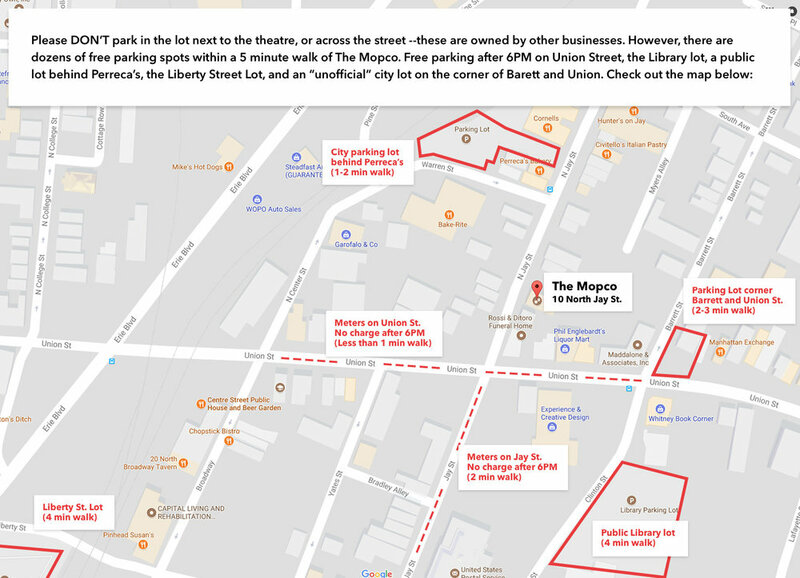 Plenty of Free Parking Near The Mopco!